Hi, I am Brianne, former-Chemical-Engineer-turned-Stay-at-Home-Mama-and-Recipe-Developer over at Cupcakes & Kale Chips. I am so excited to be guest posting here at One Creative Mommy. I have a wonderful husband and two amazing little boys, and my recipes reflect the way I cook for them and the rest of my family – a balance of healthy meals and snacks, with some over the top treats mixed in. Since I have a wheat allergy, many of my recipes are gluten-free, but I hare dealing with all of the crazy flours and ingredients, so I tend to lean towards things that are naturally gluten-free. With the holidays coming up faster than we all care to admit, I thought I would bring you an easy and super-yummy cookie recipe for your upcoming cookie exchanges and parties, or even just as an after-school treat. 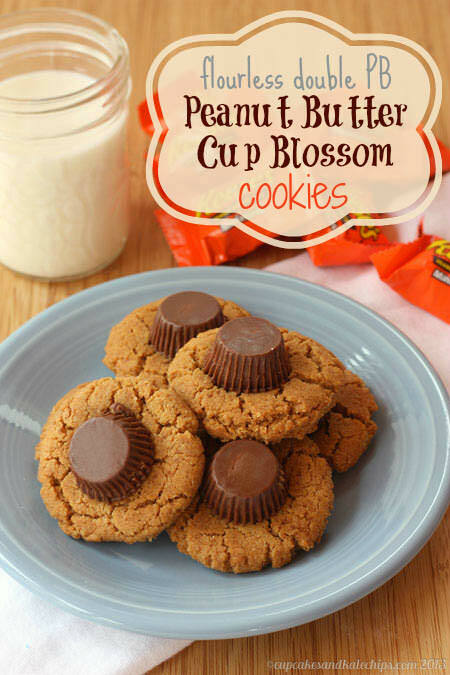 And the best past is, whether you are gluten-free or not, there are perfect because they are completely flourless Double PB Peanut Butter Cup Blossom Cookies. In my family, we all have our staple cookies we make every year. I make Snowballs, Snickerdoodles, and Almond Crescents, my aunt makes “Brianne’s Cookies” (I swear I have no idea what they are called), and my mom makes Chocolate Chip and Peanut Butter Blossoms. I love those peanut buttery cookies with the little chocolate Kiss on top. But since I do try to be “gluten aware” and limit how much I have, I thought a gluten-free version was in order. And a double peanut buttery one at that! I am a total peanut butter fanatic, so rather than using gluten-free flours, I just amped up the PB factor by making flourless peanut butter cookies, then, to put the over the top – a peanut butter cup instead of a Kiss. Preheat your oven to 350°F. Line cookie sheets with parchment paper. Using a fork, mix together the sugar, brown sugar, and baking soda in a bowl. 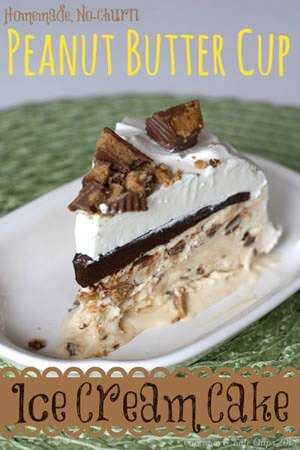 With a hand mixer or stand mixer, beat in the peanut butter until cream. Form balls using about 1 tablespoon of dough, place on the cookie sheet and flatten to about 1/2 inch thick with your palm. Bake for 10-12 minutes, or until slightly golden and set. 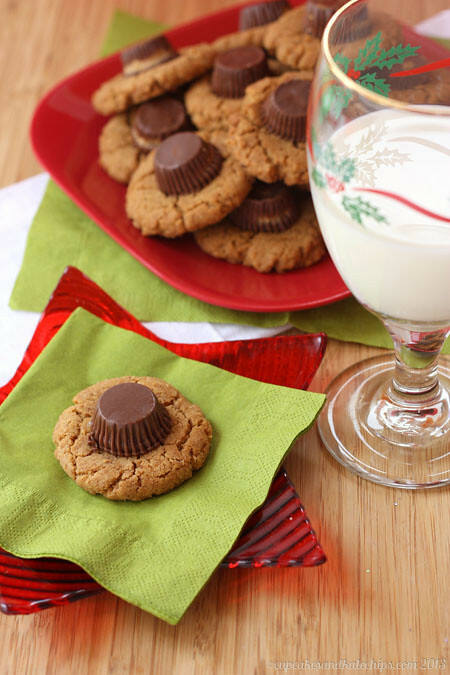 Let cool on the sheet for about a minute, then place a peanut butter cup on top of each cookie, tapping slightly so that the chocolate “glues” it to the cookie. Cool for another five minutes or so on the cookie sheet before removing to a cooling rack to cool completely. Brianne is one of my absolute favorite gluten-free bloggers. 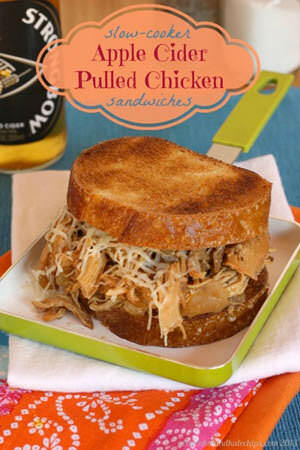 I love to browse her site and find yummy meals that my whole family can enjoy. I was thrilled when she volunteered to guest post for me! I hope you check out her site and find some yummy treats for your family, too! (I know we’ll be trying out those peanut butter cookies really soon! These cookies just seriously look like a dream come true! So much yumminess! I hope you like them, Kayle! I am forwarding this to my daughter. Her husband and son have had to become gluten free and she is looking for cookies! looks relish! I hope she likes them, Marji! My mom also says she used to always make gluten-free pb cookies-I remember her making them, but it’s been so long I don’t remember what they tasted like! What is the texture of your cookie like? Thanks! Never would of know these were flourless! Wow they look great! Thanks for linking this to Less Laundry, More linking party! 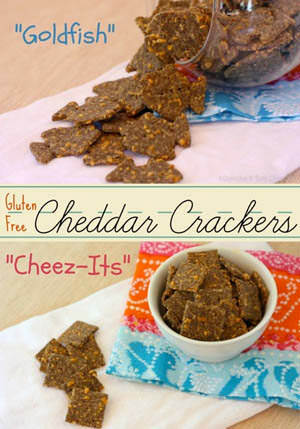 Was looking for a gluten free pb cookie and this looks uncomplicated and yummy! My question is, the ingredients state 1 t baking soda but in the directions you mentioned baking powder. Could you please clarify as I am dying to make these! Thanks! Thanks for noticing the mistake, Michele. I checked with Brianne, and the correct ingredient is Baking Soda. I corrected the instructions in the post. YUM! I make that same recipe but I’ve never put the candy on top. Great idea!! Thanks, Jo-Lynne. You can never have too much candy in a cookie, right? Your cookies look delicious. Thanks so much for sharing with Adorned From Above’s Link Party. Have a great week. Love this- shared on my Facebook page for my grain-free friends! Thanks, Sarah! I’m headed to your site to check out your cookies. 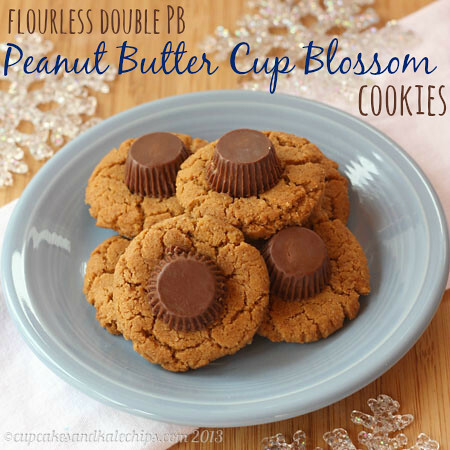 Heidi, these look delish….I LOVE the PB/Chocolate flavor combo! Thanks, Marilyn. That’s a favorite flavor combination for me, too.